Summary: The second book of the George Smiley series, Smiley works to solve a murder. I am going back and reading the first two of the George Smiley series after having reading the more popular third to sixth books in the series. These are not as good as the Karla trilogy (starting with Tinker, Tailor, Soldier, Spy). But they give some good background on Smiley. In the middle of the first book Smiley resigns from the British intelligence service. I believe this is the only book of the Smiley series that has nothing to do with espionage. One of Smiley’s friends from the intelligence service during WWII contacts Smiley because of a suspicious death of an associate. The woman had written expressing concern that she might be killed and then only a few days later she was found murdered. This is a traditional Smiley novel. Clues very slowly are revealed and what was originally a pretty clear cases turns murky before Smiley figures it all out. 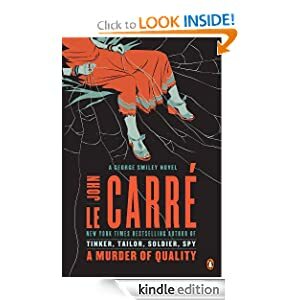 This seems to be Le Carre’s exploration of a traditional murder mystery to see if he was going to keep writing spy novels or become a mystery writer. This is good, but I am glad he kept writing spy novels. It is the spy novels where he excels.